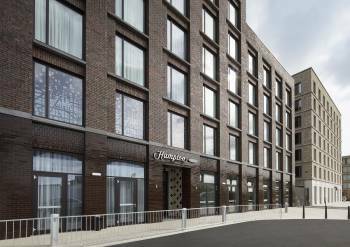 Located just one mile from London City Airport, Hampton by Hilton London Docklands offers multiple connections to countries across the world, with 40 different routes available. The hotel is close to key event locations such as London ExCel Exhibition Centre and the famous O2 Arena.The well-appointed rooms features our comfy bed with tub chair and foot stool or sleeper sofa bed, 32-inch HDTV and work desk with ergonomic chair. Free high-speed internet access will help you stay connected while on the road. You’ll also enjoy the convenience of having coffee/tea making facilities and iron with ironing board in your room.Hampton by Hilton London Docklands offers guests the popular free hot breakfast featuring delicious waffles or, for on-the-go travellers, On the Run™ Breakfast Bags are available. Additionally, its complimentary Wi-Fi, 24-hour business center and JumpStart Fitness Center are sure to set any guest on the right track. Recharge at any time in the hotel lobby with our 24 hour snack zone where you can purchase an assortment of snacks.